Here's another one of these. I wasn't as happy with how this one turned out, but perhaps I can think of it as a rough draft for later improvement. This, of course, is the ever-popular catoblepas, with its impossibly spindly neck and lethal breath. 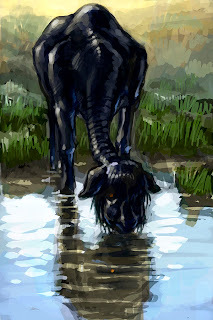 Many of the creatures featured in medieval bestiaries were based on garbled accounts of actual animals, and it's been proposed that the catoblepas is based on the gnu or water buffalo. With its heavy head and downward gaze, it can be considered an avatar of sloth, but like all venomous monsters I imagine it's mostly just pining for company. Now that I've finally replaced my five-year-old Mac, I can actually run Photoshop at a decent clip. To celebrate, here's my first-ever attempt at sketching directly on the computer. Let's see if I get faster and better with practice. I've always been fascinated with medieval monsters and bestiaries. The cockatrice is a little bit on the under-documented side, since it's often been confused with the basilisk, but it's generally agreed that it's born from a rooster's egg incubated by a toad. (Don't ask me why the end result has a snake tail.) 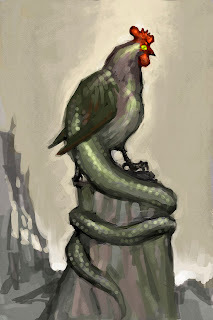 Since the basilisk is the king of reptiles, perhaps the cockatrice could be considered a form of bird royalty, and it presumably shares the same habit of poisoning its environment with its poison breath and petrifying glare. The cockatrice, then, is truly the loneliest of chickens. Whew! Finally got finished with a fairly intense project, on which more later. 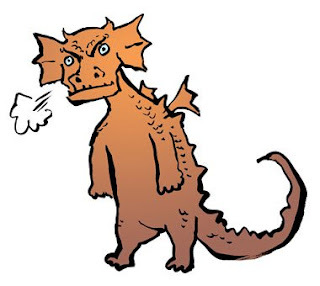 In the meantime, here's what happens when my wife says to "draw me a dragon."